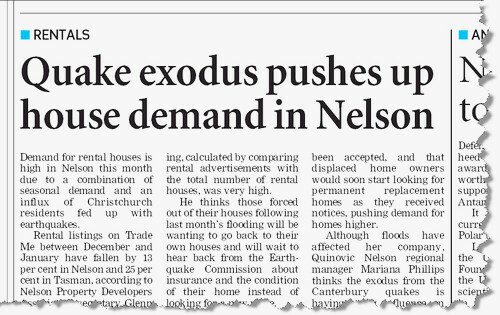 During 2011 I mentioned the word stable or stability on numerous occasions when I was referring to the price of homes in Nelson. Therefore at the end of the year, it was interesting to glance over QV’s stats released in January pertaining to homes sold in Dec 2011, but more importantly how those homes sold were placed, when they were compared to the same date 12 months prior. 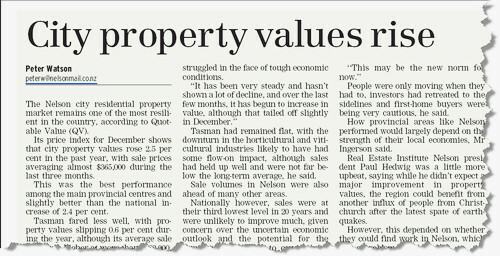 Put simply, if you had invested your money into a average priced home in Nelson in Dec 2010, then by 2011 that property would , according to QVs data, have appreciated by a bit more than 2%, or $9123 by average sales price. But (& yes Ms Kate “surname escapes me” Form 2, 1974, Otumoetai, Tauranga, I know I should not start a sentence that way but its late…..) factor in capital appreciation…….and I mean “real” capital appreciation in a NZ wide sort of way, you can’t tell me…..you’re doing bad? So even if you weren’t sure about living / investing in the region……I think I just helped you out. 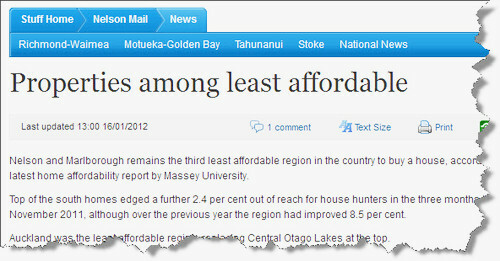 Over the last 12 months, the median rental for a 3 bedroom home in Nelson was $355 per week. See where I’m going, can’t you…..
Do your due diligence, and most certainly compare this to the situation with other regional parts of NZ? I hear from the treetops…….I think there is more money to be made….X and X and X……. But (sorry Form 2 teacher) are you sure sure, on the stability front, your money is safe? If as I am sure most of my readers here are,you intelligently recognise the whole “supply & demand” situation_ then I am already raving on to the converted……sorry for that. Don’t forget this is all based on just average pricing too, many have done better, and some possibly not so, but it reinforces the fact that our regions pricing does statistically compare verrrrry favourably with the big smokes. in NZ we have ups and downs…but wouldn’t it be nice to live somewhere where those ups and downs are minimalised, and in a way….constrained to the local environment? This entry was posted in Buyers, General, Nelson, New Zealand, rent, Sellers, Stats / Sales Data, The Market and tagged Buyers, buying, market, Nelson, NZ, renting, Sellers, selling, stats on February 5, 2012 by David Leggott. 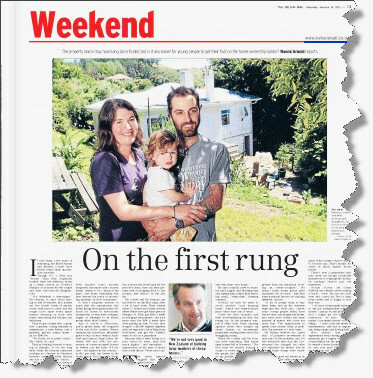 Stories, and there’s been a few, that made the news regarding Nelson real estate in the region over the last week…..
with a Nelson Mail Saturday feature article entitled On the first rung. 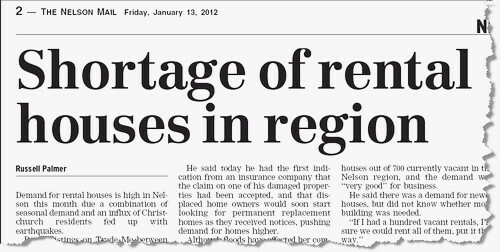 If you’re looking to rent a property in some parts of the South Island, then you already know about these headlines. Perhaps these headlines are why “round the table” at this mornings weekly sales meeting, all agents were reporting a noticeable increase in investment buyers/ activity on investment properties this past week, especially over the weekend at Open Homes. 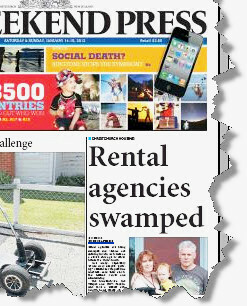 it would seem that rental ripple has reached Nelson now too…. And just perhaps, this explains one of the main reasons why everyone wants to live here……. is it because we have the Hat Back? Click on individual photos for full stories mentioned. 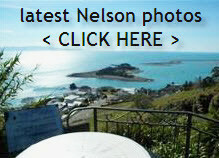 This entry was posted in Buyers, Nelson, New Zealand, rent, Sellers, The Market and tagged Buyers, buying, market, Nelson, NZ, renting, Sellers, selling on January 17, 2012 by David Leggott.